Sir George Trevelyan espoused alternative values long before the phrase became as popular as it is today. 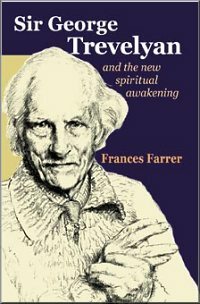 After hearing a lecture by a pupil of Rudolf Steiner, Trevelyan declared "The agnosticism of thirty-six years faded like morning mist. The spiritual world-view was clear to me in its glory and wonder." During his lifetime he explored beliefs in angels, the calming effects of crystals and the power of ley lines, alongside organic farming and communal living. In 1971 he set up the Wrekin Trust to promote spiritual education and knowledge, and in 1982 he was awarded the Right Livelihood award (the 'alternative Nobel Prize') for his contribution towards healing the planet. He inspired and encouraged the emerging synthesis between science and spirituality, putting his faith for the future of society in the transforming power of spiritual awakening. He taught extensively, inspiring communities, universities and spiritual groups worldwide. He died in the year 1996 at the age of ninety. Frances Farrer is a writer, journalist and broadcaster. She has written for most national broadsheets and has been published widely on educational subjects as well as on children's fiction. George was not only athletic, he was also handsome, charming, polished, and - very attractive, this - somewhat shy. However, while he was an undergraduate he became, he said, "dissatisfied with my body," and in 1926 went to consult a new kind of specialist, F.M. Alexander, the originator of the Alexander Technique. F.M. Alexander was very fashionable in London, having arrived from the Southern Hemisphere in 1904 with contacts and introductions among members of the upper class and the acting profession, and established a practice teaching his new perception of posture and breathing. He believed that the Technique benefited the health not only of the body but also of the mind, and regarded the people who consulted him as pupils rather than patients. At their first meeting, George received one of the best shocks of his life. Alexander surveyed him and asked, "Young man, what have you been doing to yourself?" George had gone in search of greater fitness, "finding oneself not as strong as one wished," only to discover that all the exercise he had been doing to strengthen himself was causing more trouble because of the way he used his body while he did it. He was presented with the extraordinary notion that the answer lay in "non-doing." "I had established a habit of use which was pulling the body to pieces," wrote George. "The first lesson was a revelation of wonder and a tremendous flash of vision that this man had found a great truth and the possibility of really establishing the true co-ordination of the human body." George Trevelyan's great quality as a host was one of the many attributes that made him such a success with Attingham. His background and disposition fitted him superbly as the hospitable master of the house, concerned with the comfort and amusement of all his guests. Roger Orgill recalls the amazement on the faces of new students, walking from the bus stop up the long drive with their suitcases and overnight bags, at being greeted on the steps of the house by members of the household staff, and, once inside, by this charming aristocrat so obviously in his own setting. The actor in George Trevelyan also enjoyed putting on a more or less constant play. Another description might be orchestral conductor. He liked to be in charge, he liked to give the beat, he liked to have all sections of the household orchestra following his baton. Roger Orgill says that Attingham "became a spiritual home to many" and, perhaps surprisingly, "it was a long time before George saw that was happening." Sir George Trevelyan's was one of many voices during the 1970s and 1980s to speak of changing the individual in order to bring about change for the many. He was speaking not of psychological change only, but of the essential metamorphosis of the human spirit. The new relationships between people would be built, not on ownership, obligation, or attachment, but on a highly developed, spiritual love for humankind. This quality of love would be attained through spiritual practice such as meditation. "By each meditation, we align with a universal process," said George. "The thinking of the heart is the field of action for the Higher Self... The whole reclaims the particle and re-unites it in its attunement with the world." It was the grand scale objective. "Change man and you change society." Satish Kumar, director of programmes at Schumacher College, says, "We have to live in a small community if we want to have organic relationships where men and women and children and older people are part of an organic family, where everybody understands each other, helps each other and needs each other� The most important change starts in our mind, in our heart, and in our consciousness� Fixed mind is a stiff mind. Stiff mind is a dead mind, like dead wood. Flexible mind is a living mind like a living tree." To this he adds another comment. "When we want to change ourselves we need to look out of the window at the world. The self is part of the universal force, it is not singular."